Using your spa is a great way to relax and enjoy some time alone or with family and friends, but it’s very important to be extra careful when children are in the hot tub. Ultimately, your spa can be a great place for kids to relax too, but there are several safety precautions that should be taken before bringing a child into a hot tub. Here at Spas & Stuff, we want to make sure you’re taking advantage of all of the fun things to do with your spa when your kids are in it, while remaining safe at the same time. Safety is Key: Safety first! Staying safe in your spa is the most important thing. Children under the age of five should not be using the spa, as young children tend to overheat faster than adults. 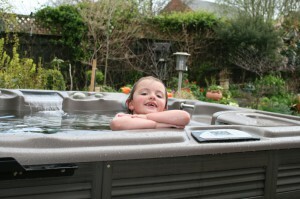 If your child is five years old or older, have them stand in the center of the hot tub. If he or she is tall enough to be in the center of the tub without their head under water, they are tall enough and old enough to be in the hot tub. The reasoning behind this test is to prevent drowning. This unnecessary tragedy can be prevented by keeping a close eye on your child, only letting them stay in the spa for fifteen minute sessions, and making sure they meet height and age requirements. Activities, Activities, Activities! : As much as your spa is a place to relax, it can also be a place to socialize and have fun. Whether your older kids are having some friends over to enjoy some time in the spa or you’re looking for something fun to do with the little ones, your spa can be the place! One activity you can do with kids is a backyard scavenger hunt. Set up fun riddles and prizes around your deck or backyard and have the final destination be the hot tub! Or, have the kids enjoy a scavenger hunt while you keep an eye on them from the spa. If your kids are too old for a scavenger hunt, you can easily set up some snacks and beverages at a nearby table so that they can socialize. Just make sure to leave the food outside of the hot tub! Accessories on Accessories: Your spa is obviously not as large as a pool, so there is not enough room for large floats and rafts, however there is plenty of room for other fun accessories! Your kids can easily bring in small pool toys to play with and you can purchase accessories like the Deluxe Spa Head Rest and the Deluxe Spa Seat Cushion to help you feel as comfortable as possible when in your spa. With small accessories and little games to play, it’s easy to have a good time with kids in your hot tub. Just remember to be safe when using your spa! If you would like to experience the fun of owning your own home spa, check out our selection of hot tubs for sale, here! We even provide free shipping to 48 states! This entry was posted in Hot Tubs and tagged hot tubs, kids, kids in hot tubs, can kids use hot tubs on August 21, 2015 by admin.